Please join us at the Climate Impacts to Water: Managing the Uncertainties of Water Supply and Quality Conference to be held at Skamania Lodge in Stevenson WA on January 25-26, 2017. 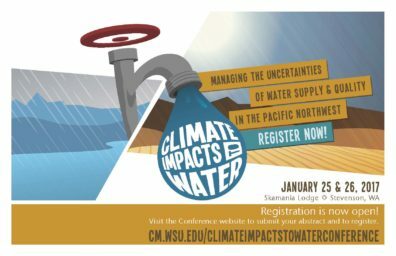 If you are interested in giving a presentation, please go to cm.wsu.edu/climateimpactstowaterconference to view information about education tracks and specifics about submitting an abstract. Abstracts are due Dec 1, 2016.
Who Should Attend? Water users, water managers, researchers and innovators. Focus The common theme will be creating a dialogue amongst the communities that use and value the region’s water supply within the context of a changing climate. Improve your understanding about projected climate impacts on water accessibility in the PNW, and the impact of sustainable management decisions. Create awareness of resources for adopting best management and water conservation strategies that operations more resilient to climate change, while minimizing environmental impact. Build on the regional network of advisors and educators. Encourage you to take the knowledge gained at the conference and promote adoption at the user level. This entry was posted in Event Announcements on October 31, 2016 by AgClimate Admin.